Hello-Hello, and thank you for coming to visit on a day that still seems to have a pall; a nagging sense at the back of the mind that everything is not okay, that for many Christmas and Hanukkah were taken this year and will never be the same. Gifts were bought and trees decorated. Parties were planned. There are toys that were ready to go under Christmas trees. Now they are having funerals. So it seems like a good day to share a few things that might boost spirits, and another of our little gift guides. Our first item is about the volunteers of Wreaths Across America. The organization was started in 1992 when the owner of a Maine wreath company had extra inventory, he asked officials at Arlington Cemetery if he could put the wreaths on the graves there. They said ‘yes’ and now wreath-laying ceremonies happen in all 50 States. Saturday was Wreaths Across America Day. Wreaths were placed on graves at 230 national and state veterans’ cemeteries all over the country. Below, David Galloway with the Scottish American Military Society lays a wreath at Prescott National Cemetery in Arizona. Another look at Arlington on Saturday. You can learn more by visiting the Wreaths Across America website, or the group’s Facebook page. Our other tidbit is more of a link, one that many may have already seen in one of the mulitple variations now circulating. This one is on Buzzfeed and titled “26 Moments That Restored Our Faith in Humanity This Year.” It is just as it sounds, below, the first item shared. That’s “The parents who made their son’s wheelchair into the best Halloween costume ever.” Another on the list, the free medical help offered to strangers after Hurricane Sandy. Click here to see the entire Buzzfeed list, being reminded of the good in people was a boost. I don’t know about you, but I needed to see this. Finally, a quick look at last minute giftables from the Princess. Snoozies Pink & Green Whales ($12) keep your toes toasty warm! Hello-Hello, and welcome to a new week. We’re in an especially celebratory mood here at the Prepatorium because it’s our Annual “I’m No Fool” Sale, with the entire store 20% off! 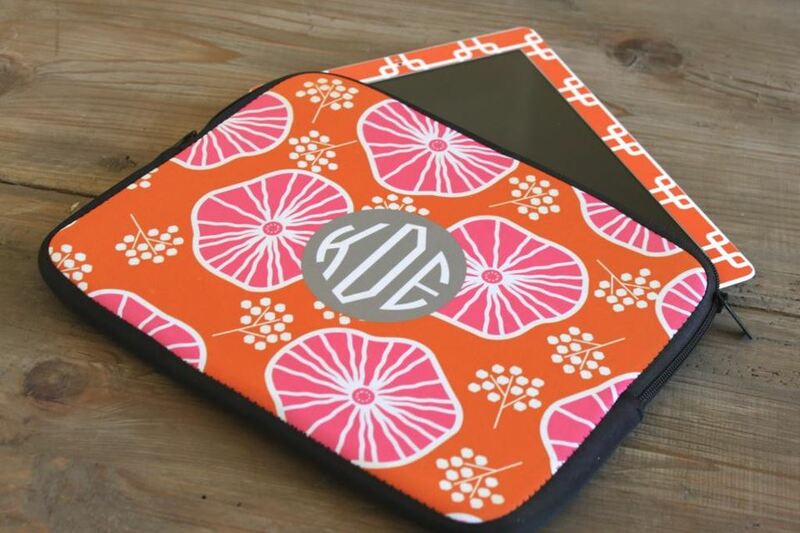 That makes it a perfect time for early ordering of wedding and graduation gifts, our monogrammed iPad accessories from Clairebella are ideal gifts for the grad. Always great shower presents, Clairebella’s Personalized Cutting Boards and Melamine Platters, at 20% off these become a smart buy for the discerning gift-giver. As mentioned in Friday’s post, we’ve included our brand new Pink Pineapple jewelry collection in the sale, below we see the Nantucket Spout Whale Toggle bracelets and the Port Anchorage Anchor Toggle bracelet, both make a wonderful gift for the grad with nautical inclinations. Each is only $25.60 with the 20% discount; as always, we’ll gift box and wrap them for you at no additional charge, just let us know in the ‘comments’ section of the order form, we’re happy to do it! Another stellar gift idea, personalized stationery. Our Preppy Ladybug designs are always popular, the Icon Flat Cards come twelve to a set, they are just $10 today! Other great buys today include our personalized Collegiate House and Garden Flags. 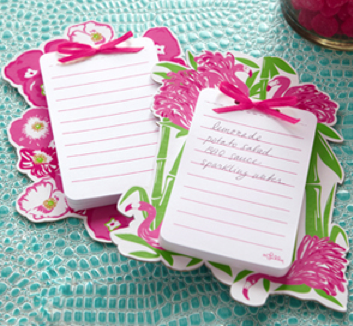 Not to mention all of our Lilly Pulitzer, this spring’s new Melamine and Acrylic pieces are bright and beautiful. We’ve just added the snappy Jonathan Adler Ear Buds to our inventory, they’re cute as can be, $16 with today’s sale. The soft silicone buds fit perfectly inside your ear, 6 ear bud tips are included, and best of all, the 46″ cord comes with a free cord keeper, for those of us a little, ahh, ‘ear bud challenged.’ They also match our Adler iPhone 4 cases, offering the opportunity for a coordinated look. The “I’m No Fool Sale” also offers outstanding bargains on merchandise being discontinued that is *already* on sale, like our Jonathan Adler iPhone 3 Cases. Originally $19.50, they are retailing for $15, with the additional discount the cases are only $12, a great price for a designer iPhone case! Also a big bargain, the Scout Original Dean-O totes in solid pink, green and blue. Another bag we are closing out, the Gina Tote from Milano, a fab bag with a magnetic closure, 2 zippered pockets on the front, 1 zippered pocket on the back plus 2 more pockets inside, a big help for those of us who like to have things organized. Originally the Totes were $29.50, but they’ve been marked down to $19.50, more than 35% off; with today’s additional savings they’re only $15.60. Today’s goofy little post doesn’t even mention our goodies from Sloane Ranger, Lovie & Dodge, Boatman Geller, Sailor Bags or Kiel James Patrick, but they’re all included in the sale. Just use promo code APRILDEAL at checkout to receive your discount. As always, we’re here to help if we can, don’t hesitate to give us a call, the toll-free line is 877-353-7737. Hello-Hello, it is a wonderful new week here at the Prepatorium. Today we can share the splendid news that there will be just such an item coming this summer. First, a bit of background on the Lilly Pulitzer Sorority Collection, the company created its initial group of Greek-licensed prints in 2010, shown below. Delta Zeta, Delta Delta Delta, Kappa Delta and Kappa Kappa Gamma were the first to have patterns designed for them. In 2011 Lilly took voting online, running a ‘Greek Chic’ contest to select those sororities that would be receiving their very own prints. More than 315,000 votes were cast, winners were announced by Janie Schoenborn, Fashion Director at Lilly Pulitzer. (You can watch the announcement on You Tube. Those being added to the Sorority Sisterhood included Alpha Phi, Alpha Delta Pi, Delta Gamma, Chi Omega, Kappa Alpha Theta. A similar promotion was run to select the sororities receiving prints in 2012, results were again announced on Facebook and You Tube. Janie was joined by sisters from the Kappa Kappa Gamma chapter at Rollins College for the big announcement. This time there were more than 1,000,000 votes and five more sororities were selected to have a print designed for them. Those in the Lilly Print Class for 2012 are: Alpha Omicron Pi, Alpha Xi Delta, Phi Mu, Pi Beta Phi, Sigma Kappa. All items in the sorority collection include the Original Tote, Makeup Bag & ID Wristlet, and the wildly popular Murfee Scarves. We show them below in the Tri Delt print, a certain TQM was a founding member of the chapter at a great Midwestern University. 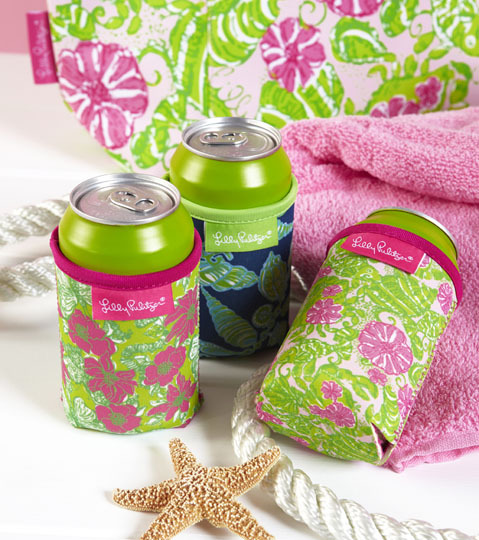 So now the news on what is coming in sorority prints this summer: there will be authentic Lilly sorority iPhone covers (like these), Cold Drink Eco-Tumblers (like these), and Dry-Erase boards (like these). 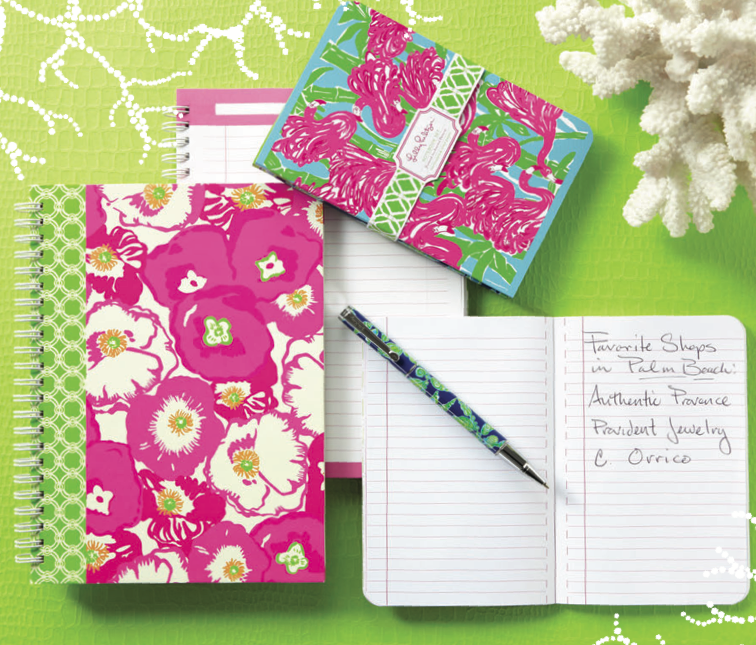 We’re told these will be available in 14 of the sorority prints, and items should be shipping to us the same time as the Lilly 2012-2013 Agendas, that sounds like the makings of a perfect back-to-school package to me! We will be taking pre-orders for the collection at the same time we start our Agenda pre-ordering. Because we are sensitive to the pocketbook challenges encountered in school, The Preppy Princess will offer a special volume discount for any orders with 6 or more of the same item. And our $2 shipping for all orders over $75 will be in effect as well, hopefully this will make things a little more manageable for everyone. We’ll let you know when we know more, and will share pictures as soon as we have them. Until next time, may your afternoon be as sunny as ours. We thought nothing would be better to start a fresh week than a look at some of the new goodies in our spring Lilly Pulitzer Stationery and Gifts collection. We begin with a group of items that is already very popular, the new Acrylic Collection. Above we also show the matching glasses, each of these holds 18 ounces, they are $19.50 for a set of two, available in Nice to See You and Luscious. Of course, there are bright new patterns in the acrylic Wine Glasses that match the tumblers and pitchers. I don’t think I’m alone in saying the Wine Glass Sets have emerged as a go-to hostess gift on more than one occasion, they are $19.50 per set of two. This spring’s patterns are Luscious, Nice to See You and Fan Dance, like the other pieces in this group, the wine glasses are BPA-, Lead-, and Phthalate-free, as well as dishwasher safe. There are also new paper party supplies to perk up your table. The Consort thinks I should be using these all the time, he seems to believe there are issues with spillage (it washed out of the carpet, honestly), so seeing me with a lid on my drink makes him particularly glad to see the Eco Tumblers return in even more patterns, these beauties arrived last week, they are $14.95. Oodles of paper products have arrived in the last week, these Notebook Sets are just part of the batch. For only $7 you receive a set of two 4″ x 6″ notebooks filled with lined and perforated paper, that is a price that is pocketbook friendly. Also in stock, the spiral-bound Mini Notebooks in Fan Dance and Scarlet Begonias, shown below with the Notebook Sets we just described up above. Lilly’s ‘Catchalls‘ are new this spring, they come in a beautiful open box filled with 150 sheets of Lilly paper and one of those cute pink Lilly pens. Offered in Chum Bucket, Fallin’ in Love and Fan Dance, you get all this for only $13.50, making this a great giftable. Another cute little giftable, the new Fridge Magnet Note Pads have 60 lined and perforated sheets of paper, perfect for those little “don’t forget” notes and shopping lists ($7). We like this addition to the spring line, elegant Pen and Notecard Sets in Chum Bucket and Fallin in Love. The sets have 10 notecards embossed with gold foil for an upscale touch, matching envelopes and pen, they are $28 and in stock. Also ready to ship, Lilly notecards that are more whimsical, the spring 2012 Boxed Note Cards are offered in Fan Dance and Scarlet Begonia, these come with 12 assorted notecards and matching envelopes, they are $14.50. Our next item is ideal for spring break and beyond, the Insulated Coolers are all in stock and ready to ship now. Below they are shown left to right: Chum Bucket, Fallin’ In Love, Scarlet Begonias. These are water-resistant, have an outside pocket, micro-fiber EVA lining, and come with an attached can opener. For that bottle of Diet Coke, cough-cough. The Coolersare $29.50 and just begging for beach time. The straps are available to ship at the end of the week, as are the spring Koozies. Also due here this week, a new item we like a lot – Lilly’s Tech Wristlet/Camera Case. These are ideal for your camera, cell phone, mp3 player or other on the go item that you want to keep cushioned safely. The cases are made of neoprene and lined with a soft material to prevent scratches, best of all, they are only $15. The Tech Wristlets close securely with a zipper, have an interior storage pocket, and measure 5-1/4″ x 3.5″ x 3/4″. The fab new iPad Cases will be arriving at The Prepatorium this week. The new cases are for the iPad 2 only, they are available in (left to right) Scarlet Begonias, Chum Bucket, and Fan Dance, they are $29.50. If in need of a case for your iPad 1, we still have them in You’re Flagged. Also on hand, the new and improved Lilly Market Bags. Made of the same great material, the new size fits over your shoulder more easily, the new wider and shorter size still holds just as much, just in a more comfortable way. The spring 2012 bags are done in Ugotta Regotta, Fan Dance, and Chum Bucket. The foldable storage boxes will add some spark to your home, they will be available in Chum Bucket, as seen above, and Fallin’ in Love. The bigger size is 22″ long x 13″ wide x 13″ high, the smaller bin runs 12.5″ long x 10″ wide x 10.5″ high. We expect to have these in stock in another week or two. There are oodles of other additions to the collection, pop in for a visit and pick your favorites! Hello-Hello, welcome to another crazy day here at the Prepatorium. As promised in our previous post hawking mentioning Sales & Savings Opportunities at The Princess this Pink & Green Monday, we want to share a list of those items that will have special discounts/prices in addition to the 20% sitewide discount in place this Monday. The always-popular Lilly Pulitzer Agendas and Pocket Agendas (pocket size Navy Bloomers here and Docksider here) are all 10% off before your 20% discount. More items at 10% off (in addition to the 20%) include, Lilly Pulitzer Pinwheels (now $8.50) and Paper Lanterns. 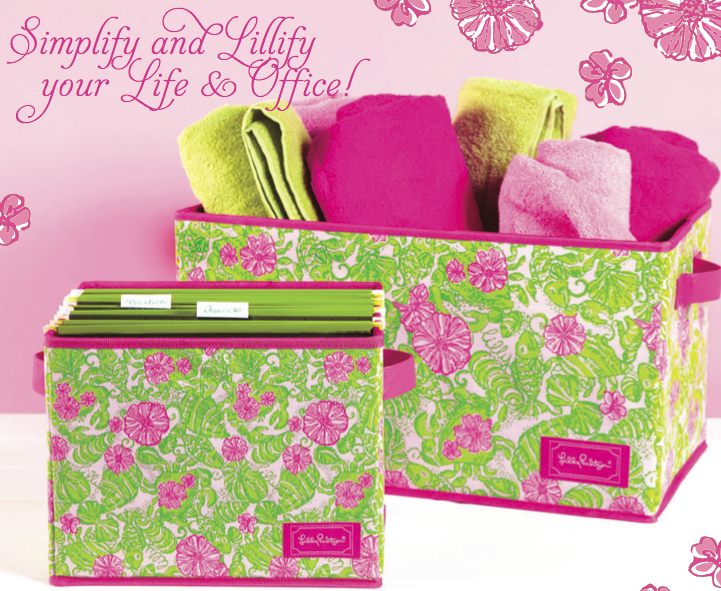 Our Lilly Pulitzer Patch Day Laptop totes are only $15 before your 20% discount. The Jonathan Adler Handy Dandy Tool Sets in Flame and Moroccan Grill are also 10% off before the 20% savings: $24.95 – 10% = $22.45 – 20% = just a bit under $18, an amazing price for an outstanding gift item. Also on the list of merchandise discounted 10% in addition to the 20% savings, our Foldover Note Cards by Jonathan Adler, now $9.50. These come in four of the designer’s most popular patterns, Diamond, Greek Key, Square Pegs, Acapulco. Also offered in the same four patterns, Jonathan Adler’s Pocket Papers (now $4.50), an extra 10% off Monday. Books always make a splendid gift, we have two that are perfect for the prep on your list; included in that additional 10% markdown, Take Ivy by Shosuke Ishizu and Lisa Birnbach’s True Prep. Everything in our Four Peas group is 20% off before your additional 20% discount, including the oh-so-popular Pink & Green Whales collection. And all of our Scout Totes and Storage are 20% off before the 20% discount. We may add a few later this afternoon, either way, may your Sunday be fun and fabulous! All Jonathan Adler Bag Tags are 10% off before the 20% discount. Hello-Hello, gobble-gobble and all good thoughts to those kind enough to pop in for a visit. We share but a mere tidbit this Friday after Thanksgiving, one of those rare instances where we toot our horn and write about the Preppy Princess store. It’s almost time for Pink & Green Monday at the Princess. That is when we do one of our two yearly sales, and everything is at least 20% off. The frenzy starts at 12:01 am ET and ends at midnight Monday night. Use promo code PGM at checkout for your discount. Sunday evening we’ll pop back in for a post sharing additional discounts on select items. Until then, may your holiday weekend be splendiferous!